For the construction of the new concrete Manette Bridge in Bremeton,WA (to replace the old steel bridge), a large number of pre-cast hammerhead and drop-in girders were to be transported from the girder manufacturing site to the bridge construction site. One of the contractor owned flat deck cargo barge was used for the transport of these girders. 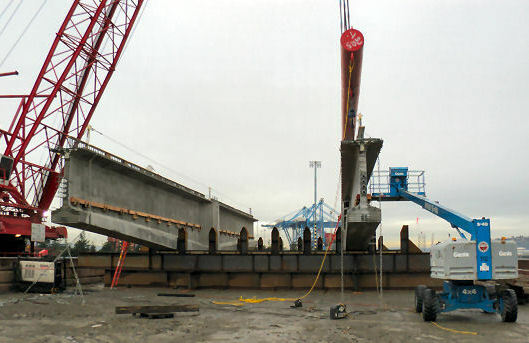 Argonautics Marine Engineering, Inc. designed the grillage structures to support and hold the concrete girders, each weighing about 163 ST. The grillage structures were design based on locally available wide flange beams. Vertical guides were added to hold the girders in place while they were being lashed to the barge deck, in accordance with the lashing plan. The local strength of the barge hull to carry the loaded grillage loads of 660 ST was checked. The barge overall strength and stability were also checked, and recommendations regarding the girder installation and lift-off order were made. For this same project, a number of other barge loads were checked, including one barge outfitted with a manlift. The stability and behavior of the barge was checked for the basket of the manlift positioned in various locations (max reach, max elevation, etc.). Photographs courtesy of Manson Construction. ■ Check stability and behavior of barge outfitted with a JLG 1200SJP manlift.